The Book of Revelation, also called Revelation to John or Apocalypse of John, is the last canonical book of the New Testament in the Christian Bible. It is the only biblical book that is almost wholly composed of apocalyptic literature. 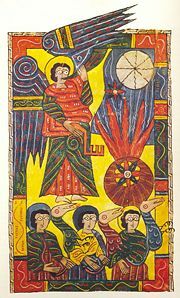 Other apocalypses popular in the early Christian era did not achieve canonical status, although 2 Esdras (The Apocalypse of Ezra) is canonical in the Russian Orthodox and Ethiopian Orthodox Churches. Revelation is composed of two main sections. The first is a message to the churches of seven cities in the Roman province of Asia, urging them to endure persecution and repent of their sins. The second is an apocalyptic unveiling of the Last Days, including such memorable visions as the Four Horsemen of the Apocalypse, the trumpet calls of seven angels signaling terrible catastrophes for mankind, the Beast whose number is 666 and his False Prophet, the woman pursued by a dragon and her child who is caught up to heaven, the Whore of Babylon, the Battle of Armageddon, the Final Judgment, the millennial reign of Christ and the saints, the Marriage Supper of the Lamb, and the descent of the New Jerusalem. The book concludes with a promise from Jesus that he is "coming soon." The Book of Revelation has produced many interpretations and much speculation. Many consider it a prophecy predicting what will happen prior to the Second Coming. Indeed, nearly every age has witnessed movements which believe that the prophecies of John were coming to pass and that the Last Days were at hand. Others increasingly take the view of historical criticism, that Revelation was written mainly to inspire first century Christians to resist persecution, in the expectation that Christ would be returning immediately. Still others consider it the work inspired more by hysteria than true prophecy. Thomas Jefferson, for example, called it "the ravings of a maniac." It remains one of the most widely known books of the Bible because of its vivid imagery and its prophecies of both doom and hope. The book is frequently called "Revelation;" however, the title found on some of the earliest manuscripts is "The Apocalypse (or Revelation) of John," and the most common title found on later manuscripts is "The Apocalypse/Revelation of the theologian." Many people mistakenly call the book "Revelations" or "The Book of Revelations" due to the long series of apocalyptic events which unfold throughout the manuscript. The first sentence of the book, The Revelation of Jesus Christ… unto his servant John, is also sometimes used as a title. The book presents a dramatic account of two visions received by the author, John, on the isle of Patmos. The first vision (1:11–3:22), is a message from "one like unto the son of man, clothed with a garment down to the foot, and girt about the paps with a golden girdle," speaking with "a great voice, as of a trumpet." It is addressed to the "angels" of the seven churches of Asia, meaning Asia Minor, in today's Turkey. 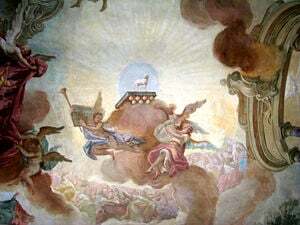 The second vision, which makes up the rest of the book (4–22), begins with "a door… opened in the sky" and describes the end of the world—involving horrifying wars, famines, plagues, natural disasters, fantastic creatures, mass martyrdoms, harsh punishments from God, and the great battle at Armageddon, the final defeat of Satan, Second Coming of Christ, and the establishment of God's kingdom of peace. 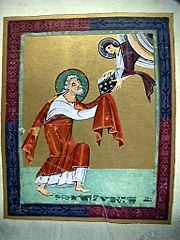 In the fourth century, St. John Chrysostom and certain other bishops argued against including Revelation in the New Testament canon, chiefly because of the difficulties of interpreting it and the danger for abuse. Christians in Syria rejected it because of the heretical Montanists' heavy reliance on it. 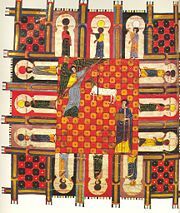 By the fourth century, however, it was included in the accepted canon, although it remains the only book of the New Testament that is not read within the Divine Liturgy of the Eastern Orthodox Church. Revelation is one of the most controversial and difficult books of the Bible, with many diverse interpretations of the meanings, characters and events in the account. In the ninth century, it was included with the non-canonical Apocalypse of Peter among "disputed" books in the Stichometry of St. Nicephorus, Patriarch of Constantinople. Protestant founder Martin Luther at first considered Revelation to be "neither apostolic nor prophetic" and stated that "Christ is neither taught nor known in it." Luther later accepted it, along with several other New Testament books he initially rejected. John Calvin, on the other hand, always believed the book to be canonical; yet it was the only New Testament book on which he did not write a commentary. Modern critical scholarship tends to view Revelation as deriving from Jewish apocalyptic literature, especially the Book of Daniel, from which it borrows freely. They often see it, like Daniel, as having been written basically to encourage resistance to an oppressive power, in this case Rome. Religious skeptics have often been highly critical of Revelation, sometimes considering it the work of a mentally ill author. Typical in this vein is nineteenth-century agnostic Robert G. Ingersoll, who famously branded Revelation "the insanest of all books." 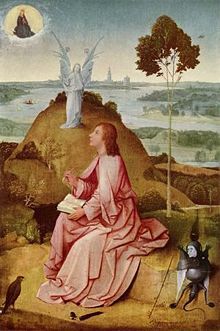 The traditional view holds that John the Apostle—considered to have written the Gospel of John and Epistles of John—was exiled on Patmos in the Aegean archipelago during the reign of Emperor Domitian, and wrote the Book of Revelation there. Those in favor of a single common author of the Johannine literature point to similarities between the Gospel of John and Revelation. For example, both works are soteriological (e.g. referring to Jesus as a lamb) and possess a high Christology, stressing Jesus' divine side as opposed to the human side stressed by the Synoptic Gospels. In both the Gospel of John and in Revelation, Jesus is referred to as "the Word of God" (Ő λογος του θεου). Explanations of the differences among John's supposed works include factoring in underlying purposes, the target audience, the author's collaboration with or utilization of different scribes, and the advanced age of John the Apostle when he wrote Revelation. A number of Church Fathers express an opinion on the authorship of Revelation. Justin Martyr avowed his belief in its apostolic origin. Irenaeus (178 C.E.) assumed it as a conceded point. 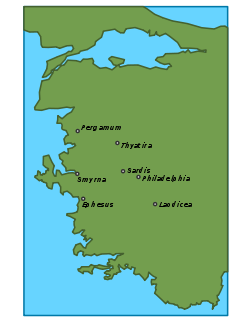 At the end of the second century, it was accepted at Antioch, by Theophilus, and in Africa by Tertullian. At the beginning of the third century, it was accepted by Clement of Alexandria and by Origen, later by Methodius, Cyprian, and Lactantius. Dionysius of Alexandria (247 C.E.) rejected it, upon doctrinal rather than critical grounds. Eusebius (315 C.E.) suspended his judgment, hesitating between the external and internal evidence. Some authorities, especially in the Eastern Church, rejected the book, however. Although the traditional view still has many adherents, many modern scholars believe that John the Apostle, John the Evangelist, and John of Patmos refer to three separate individuals. They point to several lines of evidence suggesting that "John of Patmos" wrote only Revelation, not the Gospel of John nor the epistles of John. For one, the author of Revelation identifies himself as "John" several times, but the author of the Gospel of John and the writer of the epistles of "John" never identify themselves by name. Also, while both the Gospel of John and the Book of Revelation liken Jesus to a lamb, they consistently use different words for lamb when referring to him — the Gospel uses amnos, Revelation uses arnion. Lastly, the Gospel of John is written in nearly flawless Greek, but Revelation contains grammatical errors and stylistic abnormalities which indicate its author was not as familiar with the Greek language as the Gospel's author. According to early tradition, the writing of this book took place near the very end of Domitian's reign, around 95 or 96. Others contend for an earlier date, 68 or 69, in the reign of Nero or shortly thereafter. The majority of modern scholars also use these dates. Those in favor of the later date appeal to the external testimony of Irenaeus (d. 185), who stated that he had received information about the book from those who had seen John face to face. He says that the Apocalypse "was seen no very long time since, but almost in our day, toward the end of Domitian's reign" (A.H. 5.30.3). According to Eusebius of Caesarea, Domitian had started the persecution referred to in the book. Many scholars agree that the number 666 identifying the "Beast" of Revelation refers to Nero; however those favoring a late date see this reference as an allegory, with Nero symbolizing a later tyrant, whether Domitian or someone else. Some experts believe the work was not written all at one time, with several editors having a hand in bringing it to its present form. The dating of the work is still widely debated in the scholarly community. The first three chapters of the Book of Revelation contain a channeled message from Jesus through John, to the seven churches of Asia. The remaining chapters present a series of events, full of imagery and metaphor, which detail the chronology of God's judgment on the world. For the church at Sardis, the speaker has no kind words, accusing it of being spiritually dead. He admits only that "Yet you have a few people in Sardis who have not soiled their clothes," and calls the church at large to repent, lest he come as "a thief" and blot their names from the Book of Life. In contrast, to the church at Philadelphia, he gives only encouragement; it is weak but it has endured. He promises that those of the "synagogue of Satan" will bow before the Philadelphian Christians, and assures them "I am coming soon." Finally he speaks to the Laodiceans, calling them "lukewarm" on account of their wealth and comforts. He threatens to "spew you from my mouth" because of their lack of zeal, and urges them to repent. Each of the churches receives a promise of a reward for those who persevere, relating either to participating in the blessings or avoiding the "woes" described in the succeeding chapters. 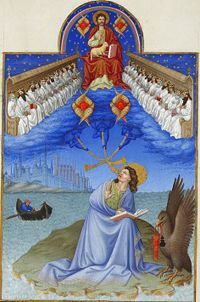 The vision of John of Patmos, as depicted in the Très Riches Heures du Duc de Berry. Four seraphim surround the throne; the 24 elders sit to the left and right. At this point a new angel intervenes, descending from above and standing on both the sea and the land. He provides the revelator with a small scroll that he must eat, for: "You must prophesy again about many peoples, nations, languages and kings." (Chapter 10) The revelator is instructed to measure the Temple of Jerusalem. Gentiles will trample the holy city for 42 months, but two "witnesses"—called two olive trees—will be given divine power to testify during this time. Fire comes from their mouths to devour their opponents and there is no rain at all during their ministry. A beast will arise from the abyss and kill them, and the inhabitants of the earth will rejoice because of the torments these prophets brought. However the two witnesses will revive after three and a half days. A terrible earthquake ensues as the witnesses ascend into heaven, and 7,000 people are killed. This concludes the "second woe." Sores break out on the people who have the mark of the beast and worship his image. The sea turns to blood and everything in it dies. The rivers also turn to blood, and the angel in charge declares God's judgment just. The sun scorches the people of the earth with fire, and the people still do not repent. The kingdom of the beast is plunged into darkness; the people only curse God all the more. The Euphrates runs dry in preparation for the coming war of Armageddon. An angel interprets for John the meaning of the "Whore of Babylon." A river of life flows through the city from God's throne, and the Tree of Life stands on each side of it, bearing 12 kinds of fruit. Its leaves will heal the nations. The city's citizens will see God's face, and there will be no more curses. Here the vision breaks off, and Jesus himself speaks again to the churches: "Behold I am coming soon." John bears testimony that he is the one who saw these things. Jesus declares that he has sent his angel to deliver his message to the churches and warns that no one must change anything written in "this book." Again he declares, "Yes, I am coming soon," to which John adds: "Amen. Come, Lord Jesus." Those who see the Book of Revelation as a prophecy concerning things yet to come expect the "Beast" and the false prophet to be two world figures who will sway the majority of people to their views. There are several schools of thought concerned with how the contents of the Book of Revelation should be interpreted. The Biblical prophecy school of thought holds that the contents of Revelation, especially when interpreted in conjunction with the Book of Daniel and other eschatological sections of the Bible, constitute a prophecy of the end times. This school can be further subdivided into the preterist view, which sees the book concerned with first-century events; the futurist view, which applies most of the events in the book into the end times; and the historicist view, which regards the book as spanning history from the first century through the Second Coming. The historical-critical approach, which became dominant among biblical scholars of religion since the end of the eighteenth century, attempts to understand Revelation within the genre of apocalyptic literature, which was popular in both Jewish and Christian tradition since the Babylonian diaspora, following the pattern of the Book of Daniel. In this view, Revelation was created primarily to encourage Christians to repent of their sins and to resist Roman persecution, in expectation of the immediate return of Christ. The view of the esoteric schools is that Revelation, like all scriptures, bears seven levels of meaning, the lowest being the literal or "dead-letter." Those who are instructed in the esoteric knowledge enter gradually into more subtle levels of understanding. Recently, aesthetic and literary modes of interpretation focus on the book of Revelation as a work of art and imagination, viewing the imagery as symbolic depictions of timeless truths and the victory of good over evil. Neo-Ebionites and other Neo-Essenes regard Revelation as related essentially to the Destruction of the Temple of Jerusalem in 70 C.E. and the subsequent Imperial Roman persecution of Jews and Christians. These schools of thought are not mutually exclusive, and many Christians adopt a combination of these approaches in the manner they find most meaningful. However, certain tendencies may be observed. The Biblical Prophecy is popular among Protestant fundamentalists, and other evangelicals. However, it also characterizes the approach of Rastafarians and other non-Christian or semi-Christian sects. Members of more mainline and liberal churches tend to prefer the historical-critical and aesthetic approaches. Roman and Orthodox churches have defined their own specific positions on Revelation. No other book in the Christian Bible has produced greater hope or greater fear than the Book of Revelation. Its promise of the immediate Second Coming of Christ and the establishment of the New Jerusalem has led believers in nearly every generation to interpret its symbols as referring to their own time and to see themselves as part of the 144,000 who will resist the power of the Antichrist and reign with Christ for 1,000 years. At the same time, Revelation's vivid descriptions of "woes" and punishments for the vast majority of mankind has led many to despair, as so few seem to be counted among the elect. In today's Christian world, dozens of groups see Revelation as being fulfilled through their ministries, ranging from fundamentalist preachers, to millennialist sects such as the Jehovah's Witnesses and Seventh Day Adventists, to popular writers of Christian fiction such as Tim LaHaye, and to new religious movements such as the Unification Church. With its rich imagery and symbolism, interpretations of the meaning of Revelation are more diverse than any other biblical text, ranging from its having been fulfilled in the first century, to it pertaining to the distant future, to its being fulfilled in the present day. ↑ The former is found in Codex Sinaiticus and Codex Alexandrinus, among other manuscripts, while the later is found in the Majority Text and others, however a number of other variations of the title do exist. Nestle-Aland. Novum Testamentum Graece, 27th ed. (Druck: Deutsche Bibelgesellschaft, 1996), 632. ↑ Luther's Treatment of the 'Disputed Books' of the New Testament www.bible-researcher.com. Retrieved November 8, 2007. ↑ Anthony A. Hoekema, The Bible and the future, (Grand Rapids: Eerdmans, 1979. ISBN 9780802835161), 297. ↑ The Devil www.infidels.org. Retrieved November 8, 2007. ↑ Greek Lexicon Strong's Concordance bible.crosswalk.com. Retrieved November 8, 2007. The Mystery of The Apocalypse www.sacred-texts.com. Bible Studies on Revelation www.confessionallutherans.org. Apocalypse of John: text, introduction, context www.earlychristianwritings.com. Catholic Encyclopedia on Revelation www.newadvent.org. Jewish Encyclopedia on Revelation jewishencyclopedia.com. 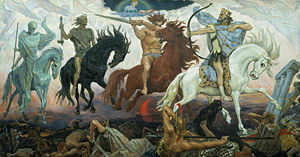 Cultural Impact of the Book of Revelation www.npr.org. History of "Book of Revelation"
This page was last modified on 17 June 2016, at 15:56.